I've heard a lot of good things about Wellness dog foods and we've tried several over the past couple years. All were big successes, both with the dogs and with me. So, when Chewy offered us the opportunity to try Wellness CORE Simply Shreds Grain Free Chicken, Wild Salmon & Pumpkin Toppers this month, I jumped on it. My dogs eat their breakfast straight, but get special toppers on their evening meal. It makes life interesting for them and I get a chance to experiment and sometime slip something by them. It makes it easier to feed them a nutritional supplement that they might not otherwise want to eat. It also gives us a great chance to try out new and exciting food options, especially from Chewy. Wellness CORE Simply Shreds comes in these foil packages that keeps the food moist and fresh. There are twelve to a box. Inside the product looks wonderful, shredded chicken in a light broth. There are only five ingredients, shredded chicken, salmon, chicken broth, pumpkin and pure water. These are meant as toppers or a light snack, not a full meal. They provide high quality protein from chicken, omega 3 from salmon and pumpkin for digestive health. The toppers look really good, as do all the Wellness products we've tried. The dogs absolutely love these toppers. My only complaint is the size. These would be good for a single or two dog family or great for a couple of small dogs. They were not designed for a household with nine large dogs. We went thru half a box just giving everyone a small taste. Chewy sent us this box of Wellness CORE Simply Shreds at no cost to us in exchange for our honest review. Well, the new year is off to a bumpy start. Bailey has a tumor on her tail. It's been there for a while and I check it periodically but it hasn't caused any problems until now. She came running in for dinner one day last week and I spotted a trail of blood on the floor. She's an enthusiastic wagger and must have hit the big bump on something to start it bleeding. I bandaged it and the next day we visited Dr B. He said it should be removed just because of the location. Tails come in contact with hard objects frequently and the bleed freely. An injury can cause the house to look like a crime scene in no time and keeping a bandage on a wagging tail is not an easy task. We set up an appointment for surgery and did some blood work. Unfortunately, Bailey also had an ear infection and though it didn't look serious, the lab report indicated otherwise. We decided to hold off on the surgery until we got the ear infection under control. She's much better now and we'll soon reschedule the surgery. A couple weeks ago I noticed a very small bump on Fudge's face just under his eye. My dogs all have lots of lumps and bumps, so I wasn't alarmed and chose to watch it. This one was different and grew very rapidly into a red angry bump with another smaller one starting up next to it. On Wednesday morning last week Rob and Fudge went to visit Dr B. The Doc looked at the bump and said it needed to go. So on Friday morning Fudge had surgery. Both growths were removed and sent to the lab for analysis. Dr B couldn't tell if they were mast cell tumors, but if they are malignant, Fudge will go back to have more tissue removed. He was loopy when he came home and spent most of the evening sleeping. When he did try to walk, he needed help to stay upright. The next morning he was feeling great, walking without help and enjoying a full breakfast. We could use some POTP to help get us good news from the pathologist. We have other minor bumps and bruises to get the year off to a good start, but for now our biggest concerns are Fudge and Bailey. My pack is growing old. Fudge is almost 13 and his pups are eleven. Sebastian is 7 and the two monster girls are 5. Just like their peeps they feel some aches and pains on cold winter mornings. I learned a lot from Bentley and Morgan about dealing with arthritic joints and all my current dogs get glucosamine chondroitin, tumeric and fish oil daily to keep their aches at bay. I've recently added moringa which has been a big success. This month Chewy offered us the chance to try a new product. NaturVet Glucosamine DS Plus, Level 2 for Moderate Care is a chewable tablet that helps maintain healthy joints. These tablets contain glucosamine from shellfish, MSM, yucca, chondroitin, calcium, vitamin E and omega fatty acids. The inactive ingredients are even impressive including brewers yeast, fish oil, and flaxseed. I haven't stopped their regular supplements, but the girls tell me that these are a very tasty addition. My dogs all take medicines, both pills and liquids, nicely, but if you have a stubborn pet who doesn't like the idea of taking a pill for any reason, this could be an excellent way to administer some help with little or no fuss. As I understand it, glucosamine helps lubricate the joints so that they move more freely with less pain. This makes it not only a good help for arthritic dogs but as a preventive measure for active dogs that aren't showing signs of pain. I noticed on Chewy's web site that Glucosamine DS comes in different levels for different needs. The one we have is level 2 for moderate care. There is a level 1 for maintenance and there is also one for cats. Chewy sent us this Glucosamine DS Plus at no cost to us in exchange for our honest review. It seems that a lot of bloggers are showing their Christmas Cacti lately, so here's a current photo of one of mine. It started flowering at the end of October and will probably go on until May. After a quiet New Year's Eve we headed into the new year with lots of new ideas and plans. First we had to celebrate a big birthday. On January 4th we all had banana blueberry muffins (with sprinkles) in honor of Sebastian turning seven. Here's my version of Sebastian. I adapted a pattern from the Knit Your Own Dog book by Sally Muir. On January first I decided to start a year long project that I've been thinking about for a couple years. I've been intrigued with the temperature blankets that I've seen online and finally made up my mind to start one. In case you're not familiar with temperature blankets, here's how they work. 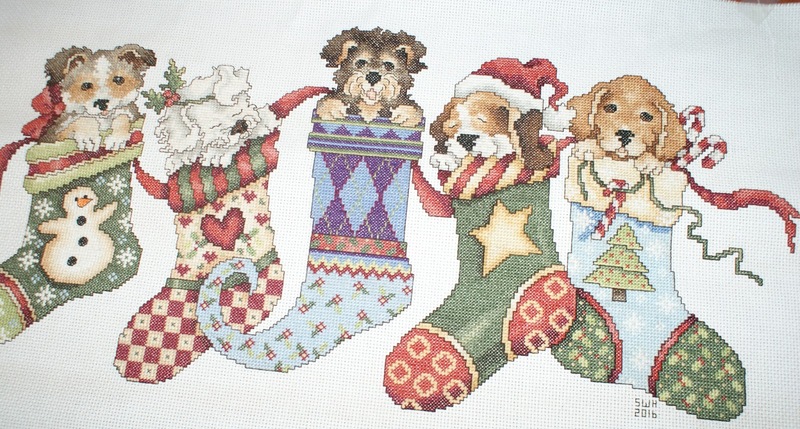 They can be knit, crocheted or sewn. You set up a palette of colors corresponding to temperature ranges and each day you add a row or more to your blanket depending on the temperature of that day. Then I couldn't decide whether to do the city I live in now or my home town, so I started two blankets, one for each city. 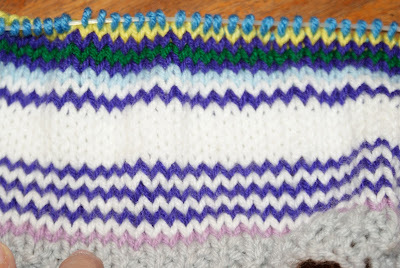 Each day I check the previous day's temperature on Accuweather, then I knit one row corresponding to the high temp and one row for the low temp. This will go on for the full year and next New Year's Day, I'll have two big, warm, colorful blankets. Here they are up to the middle of January. As if that wasn't a big enough project to start, I have another going on that involves you. 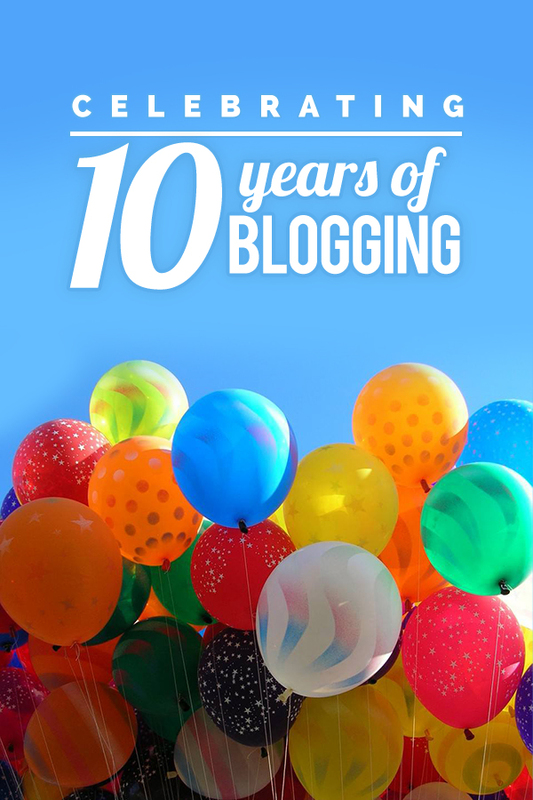 March marks our 10th Blogoversary. For the last three or four years I've been working on a special plan. I don't want to ruin the surprise, so just know that we're all going to celebrate together. It was a pretty low key Christmas this year, but we did make an effort. Before the holidays I tackled this trio. They were fun to knit and I fell in love with them as they took form. They're all big solid guys, a rabbit, a bear and a deer. I think next year I may make them again in shades of gray, dressed in blue and white. While I was knitting, Rob was busy in the garage building dog houses for Sydney and Mackey. Syd lives in the garage and likes to cuddle in a nest of blankets to sleep, but also likes to watch out the window for the next squirrel invasion. This is a double decker house that fills all her needs. Rob even made it white with black spots, just like her. When he showed it to her, she jumped on top to look out the window. She seems pretty happy with her new house. 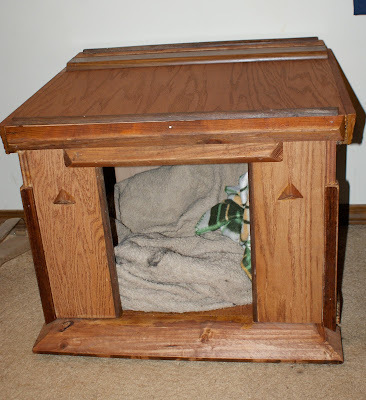 Then Rob decided that Mackey should have a house, too, even though she sleeps in the bedroom. Hers is a smaller model. Here she is checking it out. She wants to be sure that her blankets are all there. Of course, all the others had to look it over, too. Pre flu I was trying to get ready for the holidays. I did some holiday stitching earlier in the year. This was the first one finished. This may become a stocking one of these days. I've wanted to do this piece for a long time and finally found the pattern. This was my masterpiece this year. It took much longer than usual and is sizable. It measures almost 16" by 20". To give you an idea of the size, you can see that Santa's hands are almost as big as mine. 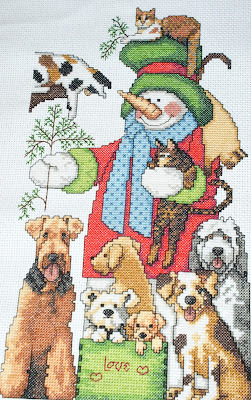 I just love this piece because I'm sure Santa loves puppies and would spend his spare time playing with them. Tomorrow, a couple of special gifts. Hi, I'm back. Although I had my flu shot in September like a good girl, the experts who decide what strain to vaccinate for each year really blew it this time. There's a flu epidemic here and in many areas of the country. It wasn't the way I planned to spend the holidays but...... 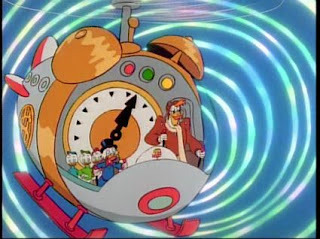 So for a couple of posts I'm going to use the Blogville time machine and go back to just before Christmas and catch up the time I missed. On October 1st, Rob and I took Fudge to visit Dr B. He was having trouble walking, was falling a lot and wasn't his normal happy self. I had convinced myself that he had bone cancer in his left front leg. The doc examined him and watched him struggle to walk, then we had a long talk. He said he couldn't rule out cancer in that leg but it was also possible that Fudge had either broken a bone or torn a ligament in the carpal region. There was a lot of swelling and pain. He also observed that Fudge was not acting normally. We opted to give him pain meds and take a wait and see position. The next few weeks were difficult for me. Fudge didn't want me out of his sight, so I tried to accommodate him. We kept him confined to the living room during the day and the bedroom at night. We helped him down the front steps when he needed to go out and only walked him a few feet, then back to the living room. One day Rob walked him as far as the neighbor's house, only a few yards and Fudge slept all the next day. That little bit of exercise exhausted him. We started preparing ourselves for the possibility that Fudge wouldn't make it to Christmas. The pain medicine helped and Fudge became more alert and started moving around a little more by himself. The swelling in his leg went down considerably and with some help he could climb onto the couch to lie next to me. Then one morning at the beginning of December I was reading my email and I came across one about joint pain in dogs. The veterinarian who had written the article mentioned some supplements that she uses for arthritic dogs. Most of them I recognized and already use such as glucosamine chondroitin, fish oil and tumeric. Then she casually mentioned one that I'd never heard of, moringa. 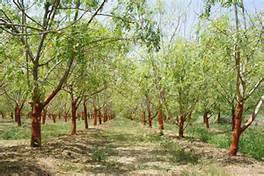 I looked up moringa and was amazed that I'd never heard of it. It's a tree native to India and grown in the tropics of Asia, Africa and South America. It's widely used by humanitarian organizations to combat malnutrition and has been used for centuries for it's medicinal value. Several articles listed scores of health issues that moringa is supposed to help. The one I was interested in was arthritis and joint pain. I ordered a bottle of moringa capsules from Amazon and decided to try them myself before using them on Fudge. After two wrist fractures and four hand surgeries, I have tendonitis in my hands and wrists and arthritis in my fingers. I wanted to test our my new discovery and see if I could detect a difference. Recently my arthritis has made my fingers stiff and painful. I can only knit a couple of rows, then have to soak my fingers in ice water and rest them for several hours. This would be a good test of the supplement. I took one moringa capsule each morning for three days. On the fourth day I woke up without any pain in my fingers and they weren't stiff at all. I put them to the real test. I picked up my knitting and started. Three hours later I was still knitting and I had absolutely no pain. OK, it was Fudge's turn. Fudge has been taking moringa daily since then and he is getting up and down with no help. The swelling is almost gone in his leg and his front legs no longer turn inward. He can do stairs by himself, though I limit his use of stairs. He still has a limp and always will from the stroke he had two years ago. Now Fudge joins the other dogs for meals and sometimes wanders around the back yard on his own. Fudge can jump onto the couch now without help and when he gets excited he does a funny little skip instead of running. My Christmas wish came true. Fudge was with us for Christmas and he's feeling good. I bought Rob some moringa seeds and he's building a greenhouse to grow our own trees. He and I and all the dogs take it daily now and our quality of life has improved.